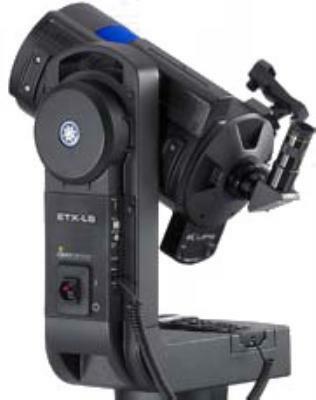 Building on the popularity of Meade's ETX series telescopes, the new ETX-LS' innovative LightSwitch™ Technology alignment system eliminates the frustration experienced by users when aligning traditional telescopes, as it automatically aligns itself, at the flip of a switch, for optimum night sky viewing. Engineered with a built-in Integrated Sensor Module (ISM) which includes GPS and Level North Technology (LNT™) sensors and the ECLIPS™ CCD Camera, the patented LightSwitch Technology alignment system replaces the "human eye" for the only hands-free alignment available in any consumer telescope. Upon activation, the scope's electronic sensors calculate the current time, date and location for the telescope and then verify the locations of two stars to build a 'real time' map of the night sky. The telescope is now aligned and ready to use without any input from the user. Equipped with an easy-to-use interface and a sensitive, wide-angle digital imager for taking vibrant, high-resolution, low-noise images of objects in the night sky, users are able to store images on the SD card or view them immediately by using the scope's video output function. With the built-in speaker and video-out jack, The Astronomer-Inside™ guides the user to the best objects in the sky and delivers a celestial encyclopedia of audio and video content that takes the user on an interactive guided tour of hundreds of night sky objects. The revolutionary ETX-LS astronomical telescope features the most advanced electronics and optics ever applied to a consumer telescope. Meade is producing the easiest-to-use, most entertaining, educational, high performance telescope on the market by combining LightSwitch Technology, Astronomer Inside™ multimedia output and a completely new mechanical design. Alignment system for completely hands free alignment. Using the Integrated Sensor Module and the built-in ECLIPS CCD imager on the telescope tube, our LightSwitch Technology allows the telescope to completely align itself with the sky without any input from the user. The user simply flips the LightSwitch on and the telescope finds its location, time, date, north, level, then locates and centers the alignment stars for a perfect alignment every time without user input. Single arm fork Altitude-Azimuth (Alt-Az) mount. Rigid structure with large precision roller bearings on both axis designed to carry large OTAs. Precision worm gear drives with 4.875” main gears in both axis for smooth and accurate tracking and slewing. Long fork arm length to allow clearance with the base for most cameras. Runs on internal "C" cell batteries for portable field operation. Hand control holder built into base. USB and other ports for accessory equipment. Heavy-duty stable tripod with quick attachment of the mount. Advanced Coma-Free optical system for performance that only professionals or extreme amateurs have had. 6" clear aperture with 1524mm focal length for an f/10 system. Standard SC threaded back cell that accepts most existing accessories designed for all Schmidt-Cassegrain models over the last 30 years. Integrated Sensor Module (ISM) with GPS and Level North Technologies (LNT). Electronically Controlled Locate Identify Position System (ECLIPS) CCD imaging module. 21" x 14.5" x 30" / 43 lbs. 29.1" x 10.6" x 10.6" / 12 lbs. Click the button below to add the Meade LS 6" LightSwitch Schmidt-Cassegrain w/ UHTC to your wish list.